So I decided to do this sort of blog post last night when I was trying out a new way to style my hair....obviously I couldn't get the full look without doing my makeup at 8pm in the evening right?? (I call this use of my time "snow madness" I've literally not left the house in 3 days now. I'm so bored!!) Anyway, I put on my beloved Estee Lauder red lippy and decided it wasn't quite what I wanted....so I delved into my case of stuff that I just don't use much anymore, but still totally love. Quick Sidenote: This is the one curse of working on a makeup counter I think. I literally can't wear anything but BareMinerals on a day to day basis, and whilst I love BM products, this does mean that a lot of stuff that I love gets neglected, only being used for "special occasions" (or on nights when I'm trying out new looks obviously...) My Naked palette literally hasn't been used in 6 months now I don't think, which is annoying as I love it so don't want to gift it on to someone but I never get to use it! Estee Lauder Pure Color Vivid Shine Lipstick in Forbidden Apple - Beautiful deep red but packed with shimmer. More of a night out look. Very good staying power though and minimal bleeding. Dior Addict Extreme in 536 Lucky (sample size) - Quite a pinky red. Not great colour payoff either really. Wouldn't buy the full size. Barry M 121 - Was given this by a friend who never wears red lipstick, which was good because it's way too orange toned for me, so I'm glad I didn't buy this myself! Colour payoff is great but just WAY too orange. I look like the Joker with this on! ELF Mineral Lipstick in Cheerful Cherry - Non-drying, non-bleeding almost perfect deep red. Very impressed! ELF Lipstick in Posh - Almost identical to the other ELF one, just cheaper packaging! Natural Collection Lipstick in Cherry Red - I love this lipstick colour as it's a little bit brighter but still a deep red if that makes sense? It's a little drying though so lip balm is needed. MUA Lipstick in Shade 1 - This is amazing for one whole pound!! It looks really similar to my Estee Lauder one, just without the shimmer. Lip liner is very much needed with this though as it's really soft but bleeds LOADS if you're not careful! 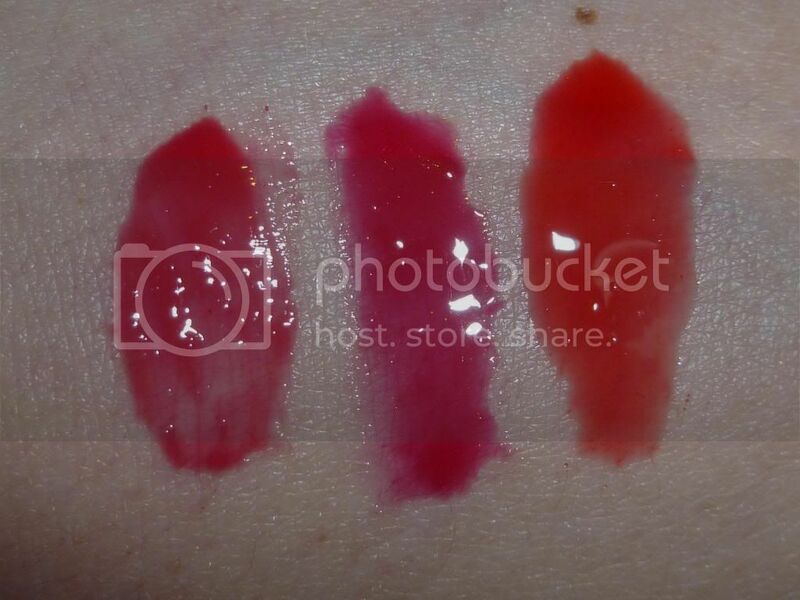 ELF Luscious Liquid Lipstick in Cherry Tarts - Eh. I really liked this once, but I'm more about the bold colour at the moment. Maybe I'll fall back in love in the summer. It's stickier than I remember too. 17 Berry Crush Lip Stain in Smokin' Hot (I think - major downside to this one is that the colour name is on the plastic wrap and not on the product at all!) - I loved this when I first bought it but after two uses I was just angry with it. It's good for popping over lipsticks to lock them in though....which is something I guess! 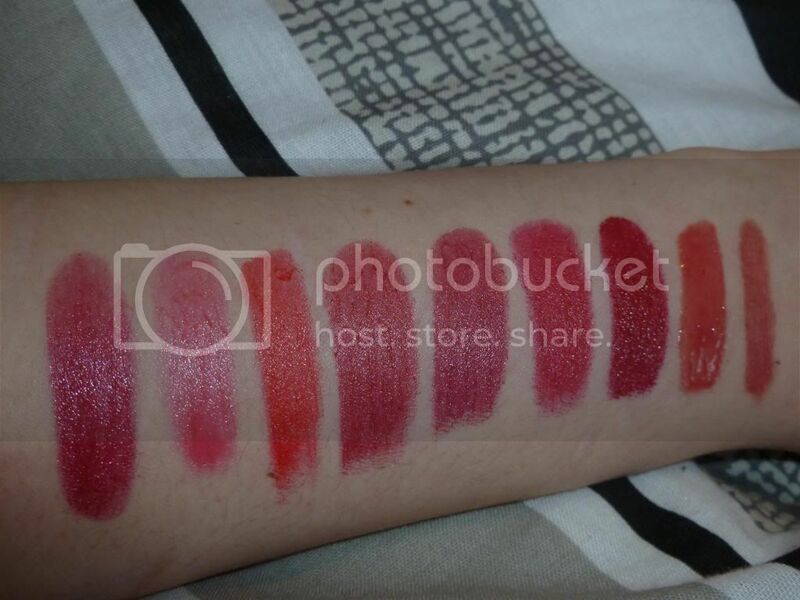 Winner: Highstreet - MUA Shade 1 for a perfect deep red shade for me! For a pound I was SO impressed with how this lipstick felt and lasted on my lips, especially when I would say it was comparable to the Estee Lauder one! The only thing the Lauder is better at is not bleeding AS much and I'm happy to shove a lip liner on first for a perfect deep red shade thanks! - Special mention to the ELF ones too as they have great staying power, but the shades aren't exactly what you see on the website so go careful! 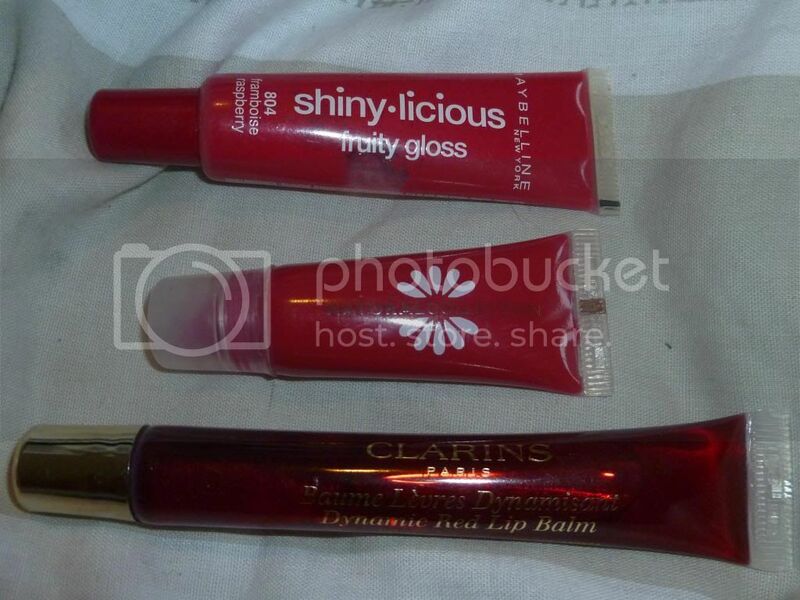 Maybelline Shinylicious Fruity Gloss in 804 Raspberry - Brought this YEARS ago (tut tut I know!) and it's still fine, but a little bit too sticky for me. Natural Collection Tinted Lip Balm in Raspberry Rhumba - I'm not sure if they still do these anymore but I do like the feel of this as it isn't sticky but the colour pay off is pretty good too. Possibly a bit too pink for me and the smell/taste of this is a bit gross. Clarins Dynamic Red Lip Balm - This was a free gift with something a while back I think but the girl at work found a stash of them in her cupboard....and we're allowed to take 2 samples home per week...and as this is marked "not for sale" on the back, it technically counts! (Quick note, no, we aren't allowed to take anything marked for testers!) The photo above does it no justice at all as it's actually a deep red with very fine shimmer in it. Completely enhances any red and adds the bit of glossiness I want without leaving my lips sticky! Smells lovely too! Winner: Highend - Clarins Lip Balm is a real winner for me...makes any drying lipstick perfectly fine for my lips and gives a great deep red colour to all my lipsticks! Makes my lips look and feel kissable! 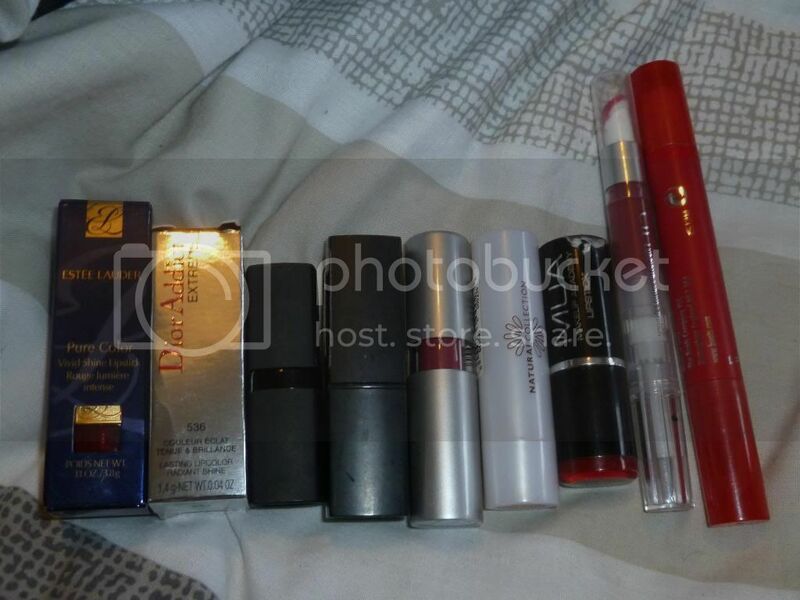 lovely post, I'm going to have to go out and buy the MUA lipstick now, it looks great!